Seoul, Korea - FigtreeLabs today is pleased to announce the release and immediate availability of MiniatureCam 1.0.2, an update to its popular Tiltshift Video Camera App for iPhone, iPad and iPod touch devices. MiniatureCam allow you record Tiltshift Video in realtime. Also it supports the photo function. It makes everything look like miniature. It offers a fun and easy way to create your small worlds. Most Tiltshift Camera Apps have complicated user interface and slow. 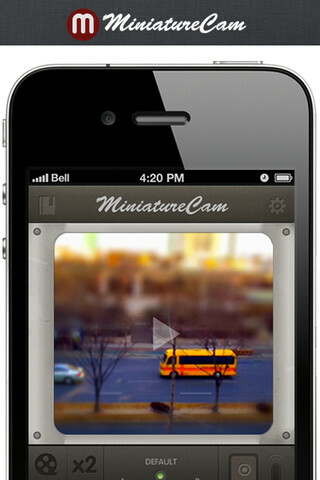 MiniatureCam is really fast and has intuitive user interface. You can make facinating Video (plus Photo) using Stopmotion effects (as well as toy effects) and Slow motion, x2, x4, x8. You can also put background music. It makes you a stunning Film Maker!! For a limited time, Miniaturecam 1.0.2 is only $0.99 USD (or equivalent amount in other currencies) and available worldwide exclusively through the App Store in the Photo & Video category. Based in Seoul, Korea, FigtreeLabs was established in 2012 by founder and designer, John Jung. The company focuses on designing simple and highly functional apps for human beings, making people's lives more smart and happy. Copyright (C) 2012 FigtreeLabs. All Rights Reserved. Apple, the Apple logo, iPhone, iPod and iPad are registered trademarks of Apple Inc. in the U.S. and/or other countries.